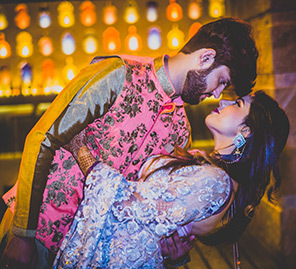 Vinet and Sanam took the entire responsibility of planning their wedding and all its functions.Their close family friends helped them pull off lovely celebrations which comprised multiple events in different locations, beautiful decor and family festivities over five days. 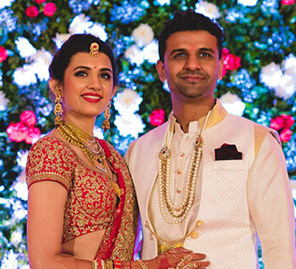 Here, bride Sanam shares more details. "Vinet and I met thanks to my mom’s sisters! Coincidentally both my mother’s sisters called my mum a day apart talking about this wonderful guy from Dubai that they knew who was moving to Mumbai. One of them gave Vinet my number and he contacted me. We landed up connecting and speaking for quite a while. We eventually went out on our first date which lasted eight hours, and well, the rest is history." "Our proposal was bittersweet. Vinet’s most prominent quality is his humor, which made our proposal so unique. One day, he called me sounding very anxious and said he wanted to meet me. He picked me up and we went for a drive where he told me that he couldn’t move forward on our relationship as his commitment issues were acting up and that he just couldn’t be with me. Vinet then insisted he come over to speak to my parents. As we entered my parent’s house, I saw both our family members holding up posters that stated ‘Will you marry me?’ He then went down on his knee and proposed - and turned my world upside down for the second time that day." "I decided to be my own wedding planner, and it was possible thanks to my parents and my mom’s sister and her husband who were so much help. It was a lot of work but worth it. It was so much fun planning our menus, going for food tastings, deciding the decor, and coordinating with so many people because it made our wedding so personal. Each event was executed just how we planned it." We decided to do e-invites instead of cards.. since everyone uses email and whats app. Cards are usually thrown away so it felt pointless and having the invite on one's phone is so useful when the wedding comes around, re-checking venues and timings become so easy. My cousins and I worked on and created the e-invites attached, and we used one of my favorite illustrator's drawings. Vinet's family, on the other hand, did distribute cards and chocolates. "We actually wanted a really simple wedding but it landed up turning into a five-day affair! The first day we had our engagement and a 'bahrano pooja' at Manjhand Dabbar since that is the temple my grandparents have been going to for years. That night, my aunt and uncle hosted a dinner for us and our guests at their house. The second day I got my mehndi done at home, and the mehndi ladies took about eight hours to complete their beautiful designs on me! The theme of my mehndi was Radha Krishna in the lotus pond. Luckily, I had my family and friends around.That night, my grandparents, uncle and aunt hosted a dinner for us at the Sun & Sand Hotel. My mehndi brunch took place at Olive Restaurant. Our pheras followed by dinner was hosted at the Laxmi Narayan Temple. Our cocktail reception party was held at the Four Seasons Hotel. This was especially meaningful because Vinet had asked me out on their rooftop bar, AER, it was a full circle moment when we went back again to AER to take out a few pictures on the night of our reception." "The decor theme for this event was centered around paper - think origami, Japanese paper umbrellas with cherry blossoms, lanterns, flowers and lovely hangings. Olive is such a beautiful place for a day event. We also had a tarot card reader, a caricaturist and many mehndi ladies to keep our guests entertained. We also had the opportunity to pick a Mediterranean menu and serve many kinds of cocktails which the guests loved. I wore a beautiful gold sleeveless gown with a layered, ruffled hemline." 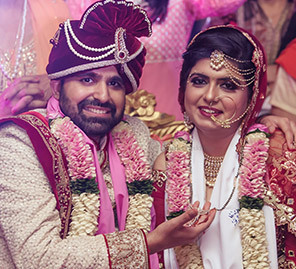 "The temple where we held the pheras belongs to my mother’s sister and her husband, which made this event the easiest to plan. They went out of their way to make sure it was perfect and their in-house decorator made the place beautiful. There were lovely tassels hanging all outside the temple as well as in the hall. The mandap was made of just flowers. The food included Mumbai’s famous vada pavs, chillas and pani puri treats, and all our guests from abroad loved the typical Indian food. The biggest surprise of the night was when they brought out a big 'doli' (carriage-style palanquin typically used to transport brides). It was gorgeous and the biggest one I have ever seen. Vinet himself made quite the entrance, driving in on a segway during the 'baraat'. I wore a peach and blue ensemble by Manish Arora. 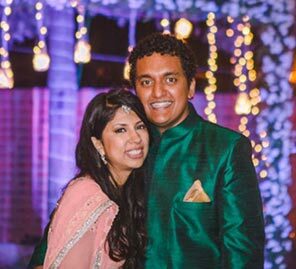 Vinet and his dad deal in fabrics, so it was no surprise when he decided to design his own outfits for the mehndi and the pheras." "Our reception decor was all about drapings, frames, flowers and massive vases. At the entrance, we had this lovely chaise where guests could take pictures and get them instantly. I had written a poem for Vinet which was printed onto a scroll and guests could leave a message for us. Our hall had an outdoor area which was lit with just candles and fairy lights. The menu was vast and included teppanyaki treats, roast duck, all kinds of noodles and much more. Our cake was the highlight though. It was a lovely hazelnut cake, and my family and friends still rave about it. I wore a gown with a deep maroon ruffled skirt with a strappy bodice-like top." "The best thing about our wedding was how relaxed we all were. You often hear of couples and their families being stressed out and missing out on truly enjoying this once-in-a-lifetime experience. We had organized everything before hand, so much so that our days went by wonderfully, we were fully rested and able to be present in every moment. It’s so important to be organized and to work with only the people you truly trust and feel comfortable with, knowing they will do their job so that you can focus on just celebrating your wedding day. As a couple, we made it a point to talk to and spend time with everybody. Oftentimes guests attend a wedding and only get to say hello to the bride and groom. It was so important to us to enjoy being with all the people we love, who put in so much effort to be there. Make sure to take photos with all your guests and to make them feel welcome. We also made sure to send our guests their wedding pictures so that they too could be a part of that experience and relive the memories. When it comes to buying your outfits, accessories and shoes, it’s all about research! I had plenty of time to plan so I definitely took advantage of that and dedicated a certain amount of time every day to just checking out things online, following the right pages on Instagram for ideas, and visiting different shops before actually buying anything. It’s your special day so take your time deciding what you want. You may come across something much better with time." "The Photo Diary team captured our wedding, and they were absolutely wonderful. We are very happy with our wedding pictures. I had different makeup artists for different days and they were all great. They gave me really different looks and if I had to do it again, I wouldn’t change a thing. The decorator for the mehndi and reception was DreamzKraft. We met many decorators but found them to be the most professional. They were so easy to work with and completely delivered what we desired."